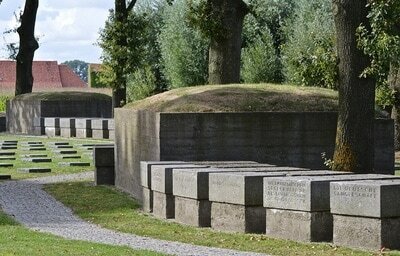 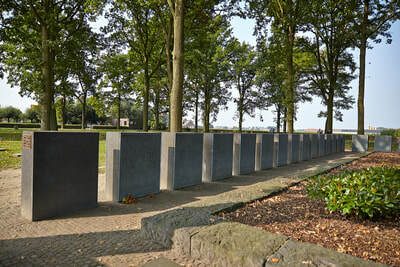 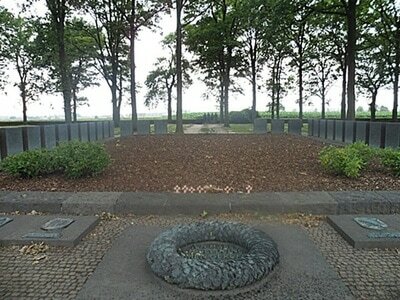 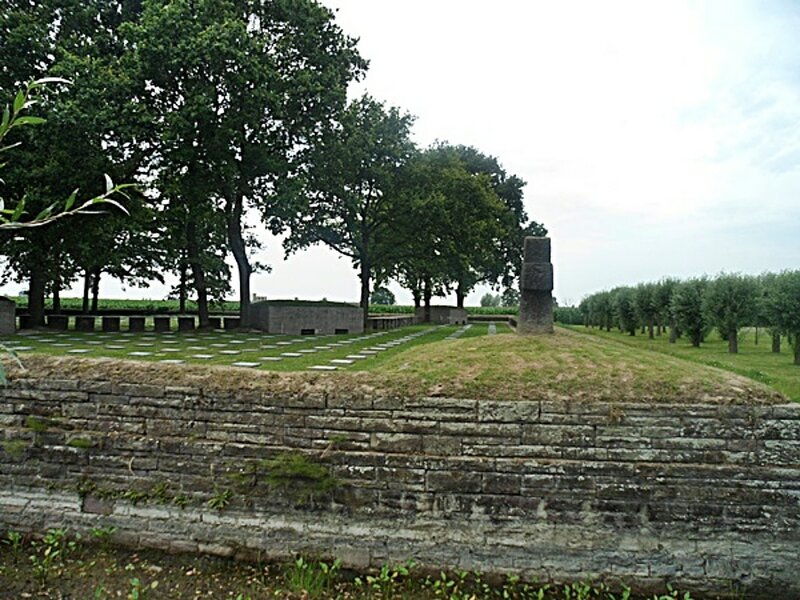 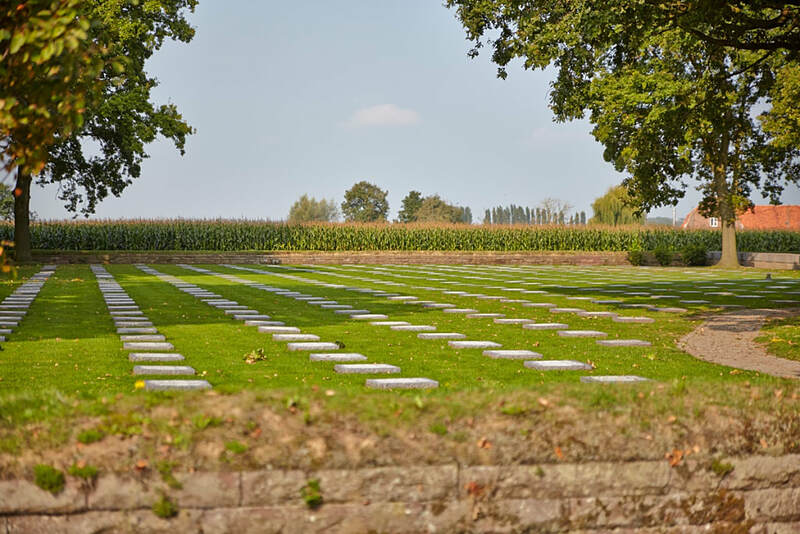 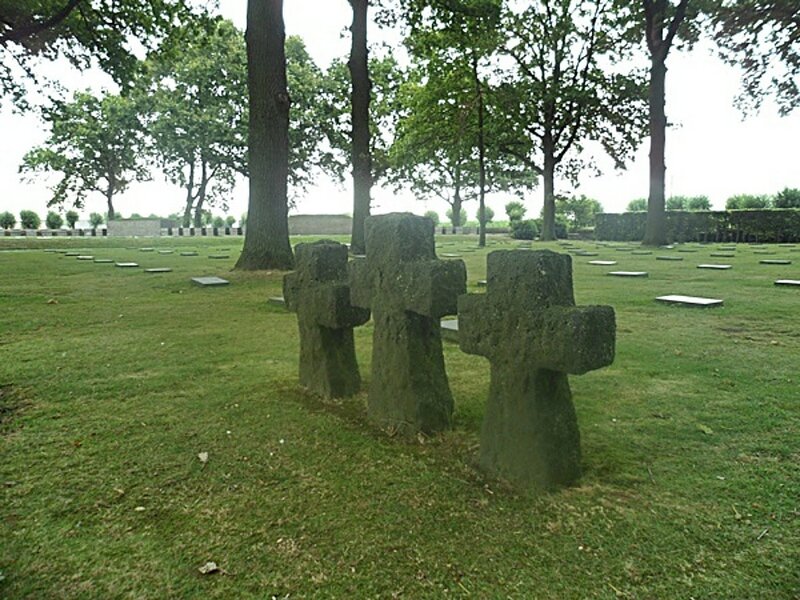 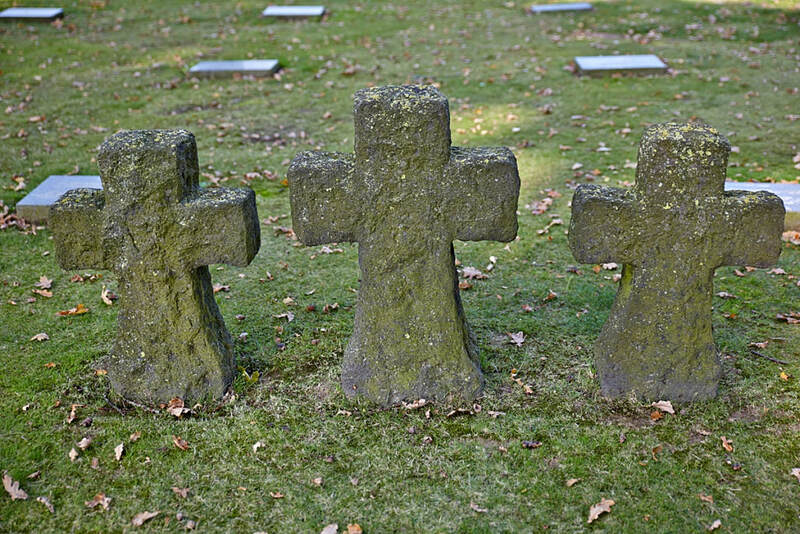 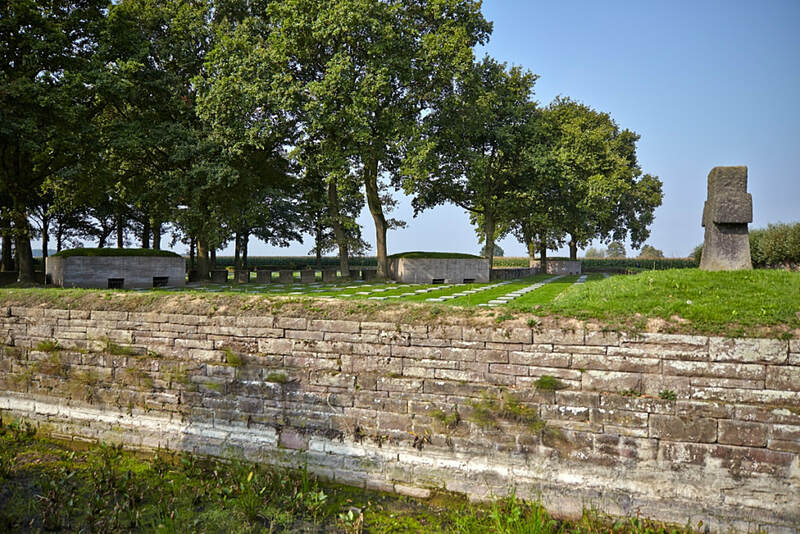 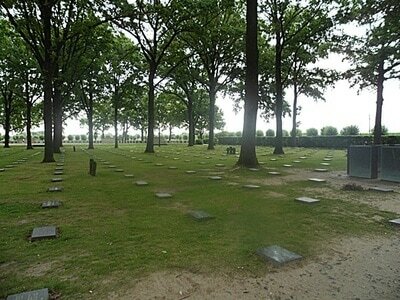 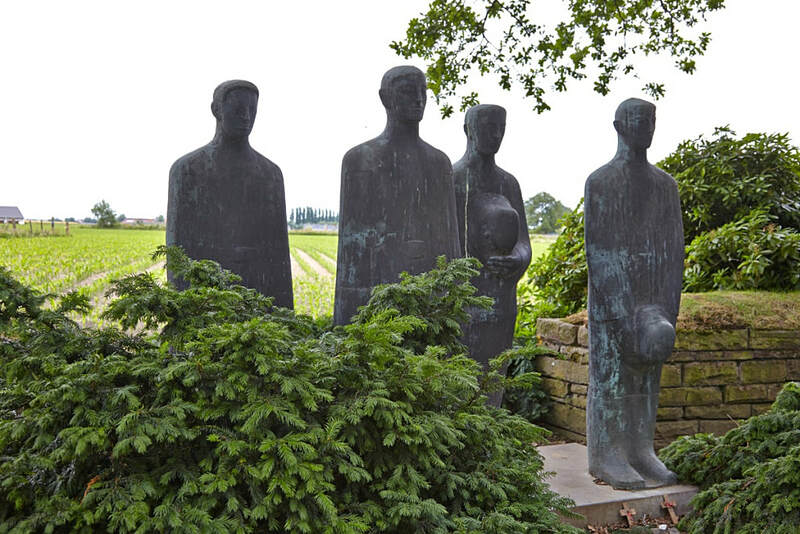 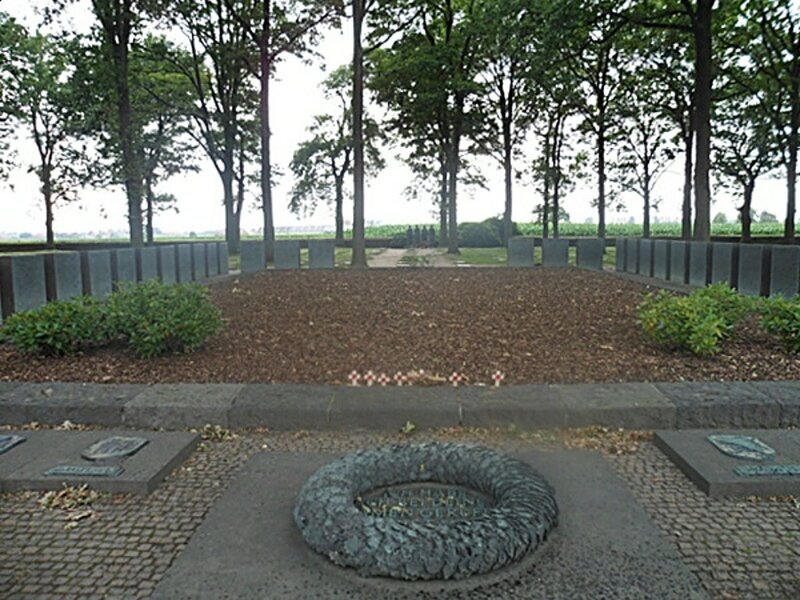 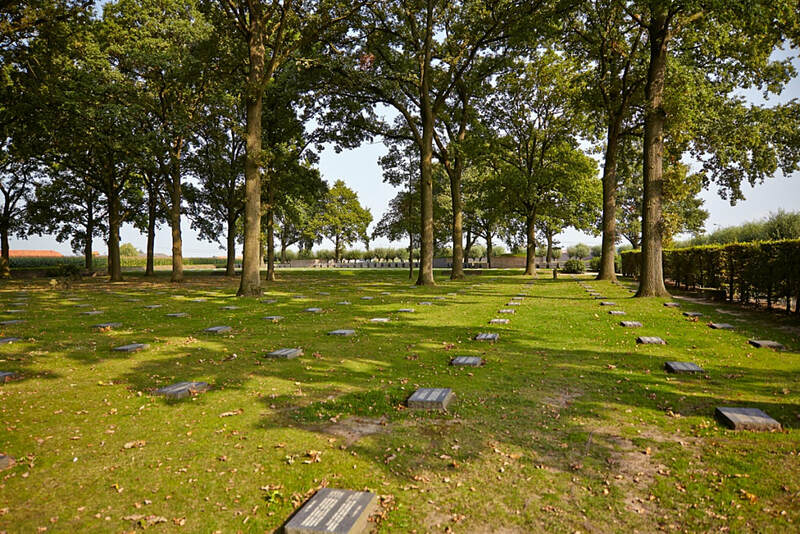 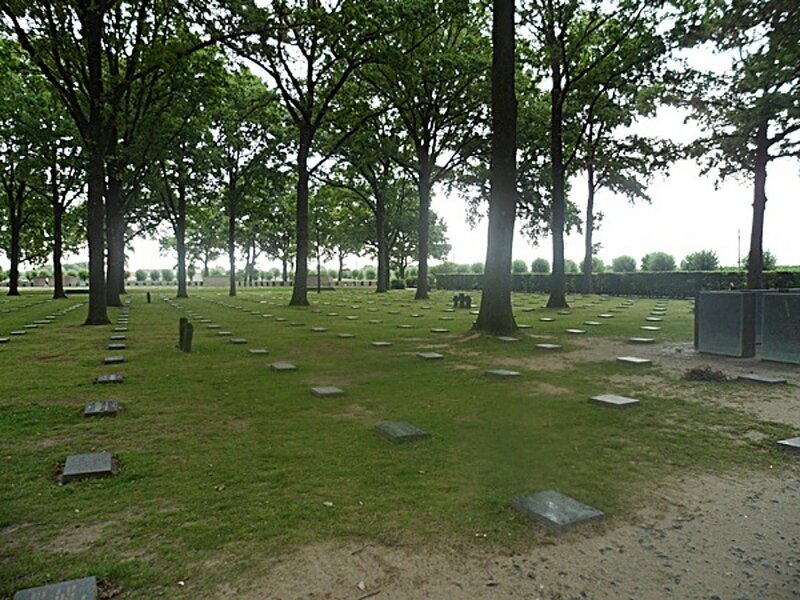 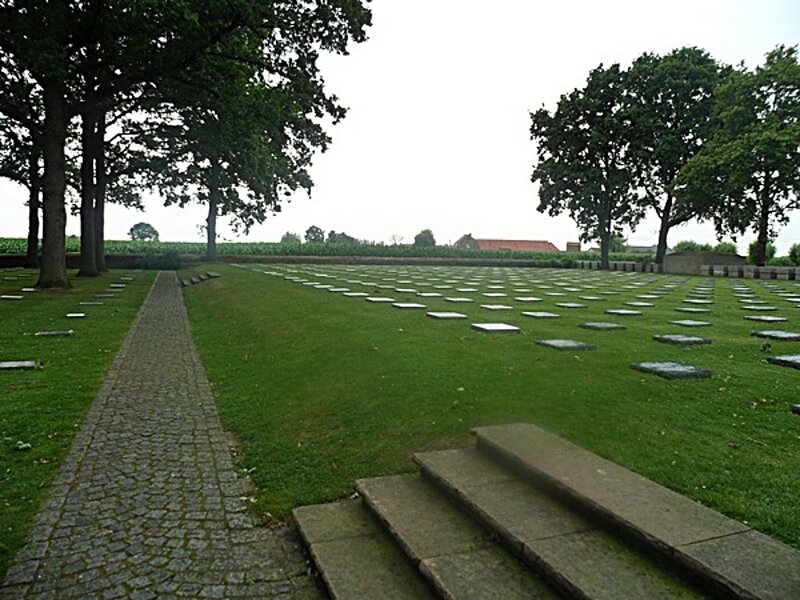 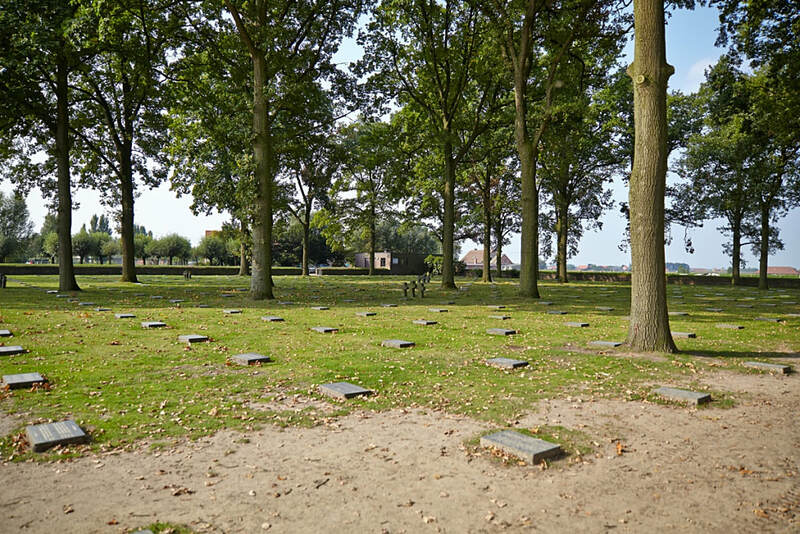 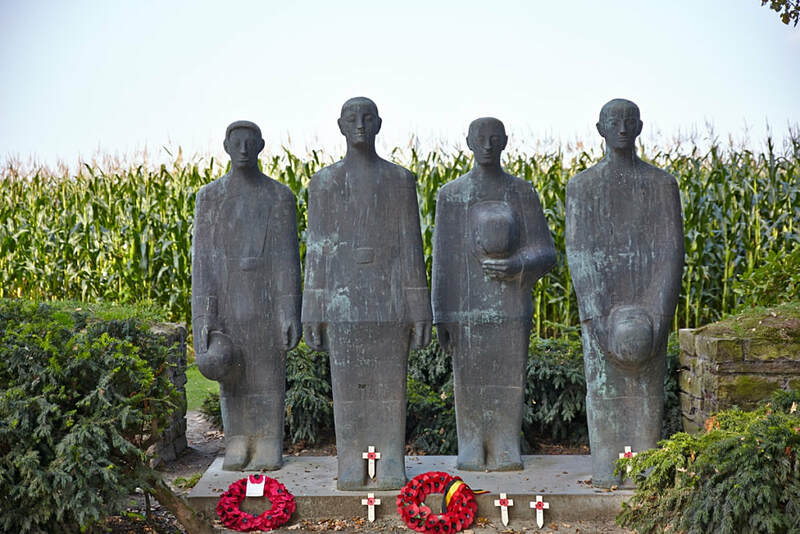 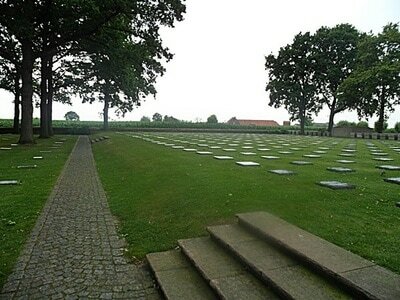 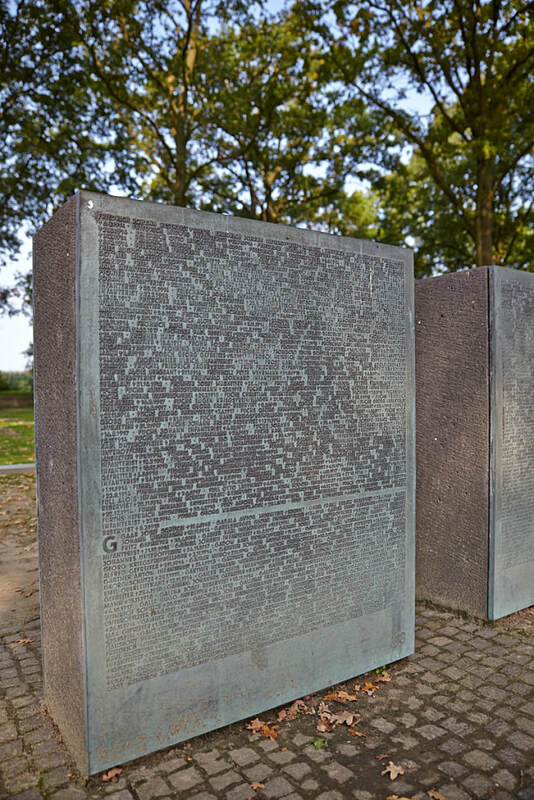 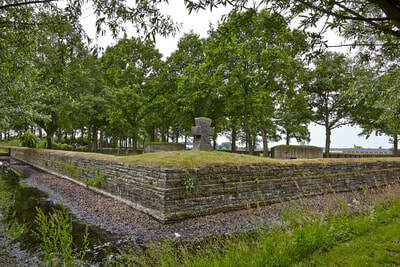 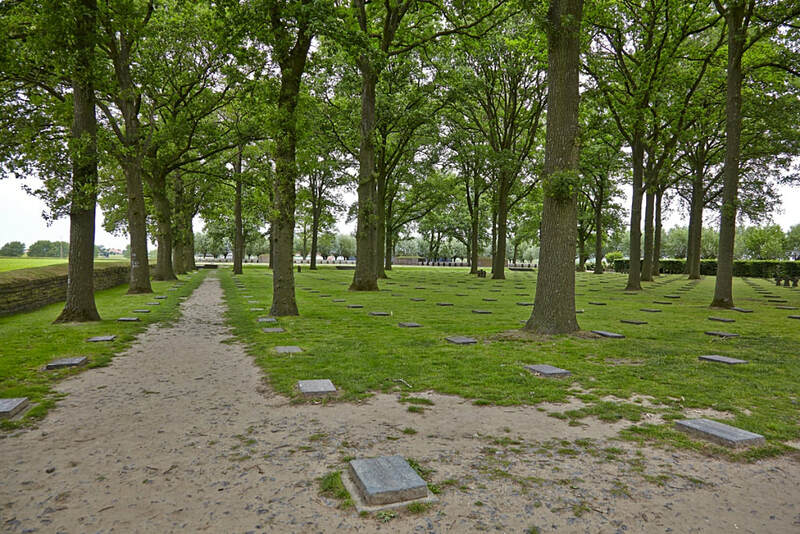 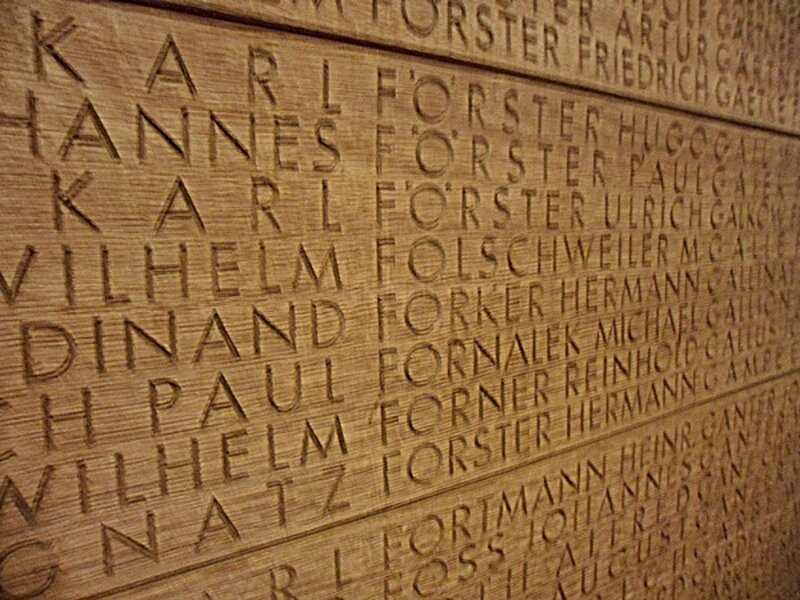 The German War cemetery of Langemark (formerly spelt 'Langemarck') is near the village of Langemark, part of the municipality of Langemark-Poelkapelle, in the Belgian province of West Flanders. 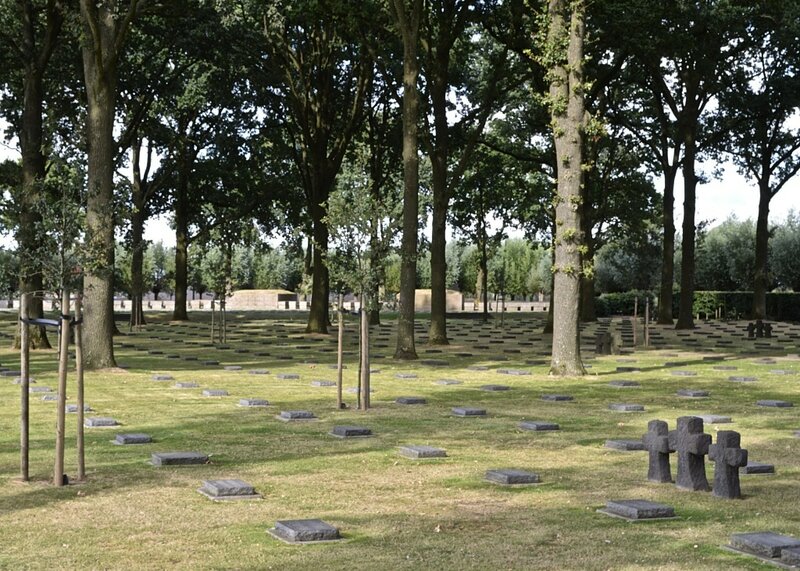 More than 44,000 soldiers are buried here. 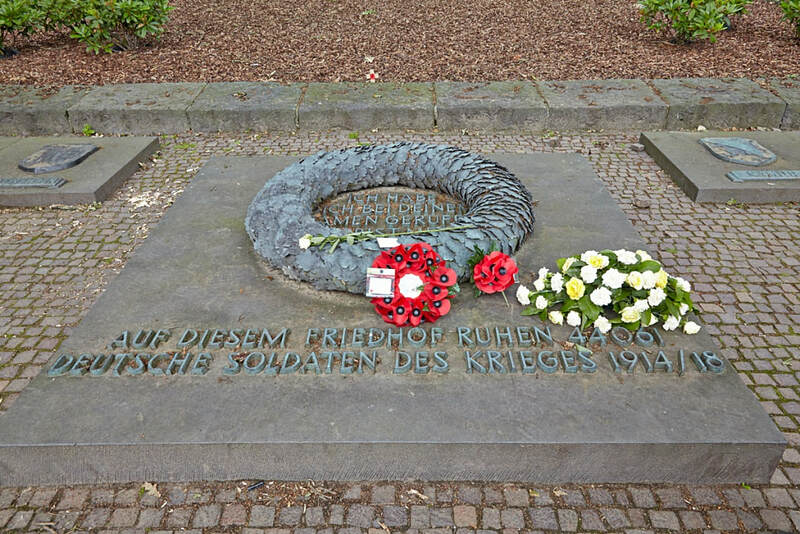 [ The village was the scene of the first gas attacks by the German army, marking the beginning of the Second Battle of Ypres in April 1915. 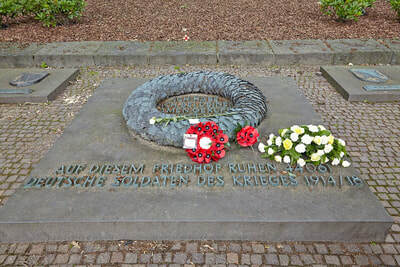 During the First Battle of Ypres (1914) in World War I, inexperienced German infantry suffered severe casualties when they made a futile frontal attack on allied positions near Langemark and were checked by experienced French infantry and British riflemen. 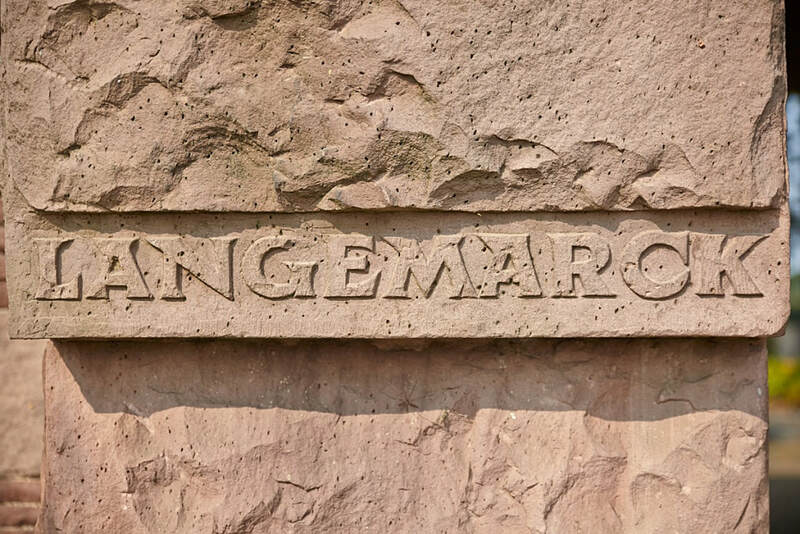 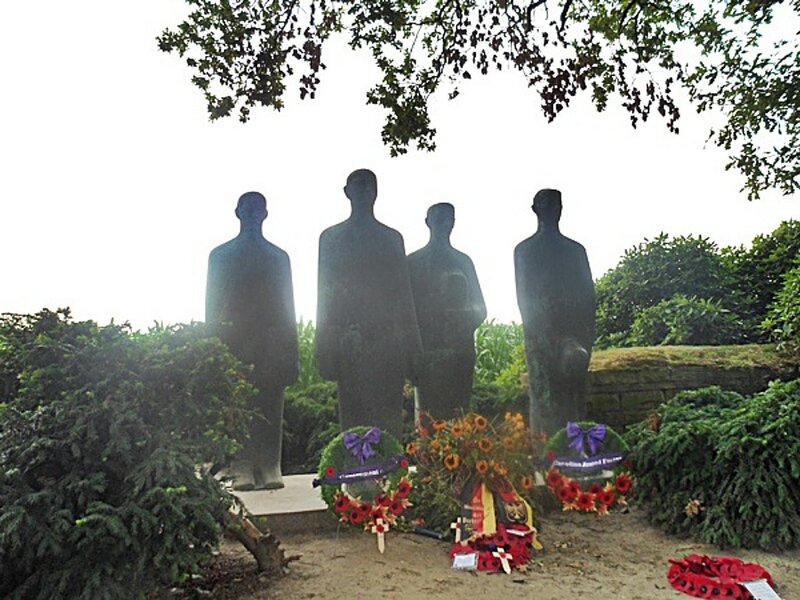 Contrary to popular myth, only fifteen percent of the German soldiers involved in the Battle of Langemark were schoolboys and students. 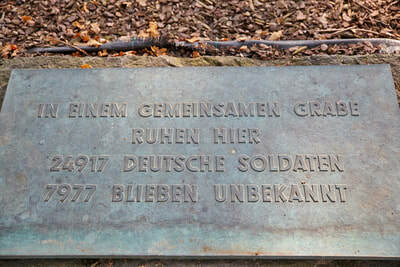 Legend has it that the German infantry sang the first stanza of what later (1919) became their national anthem "Deutschland, Deutschland über alles", as they charged. 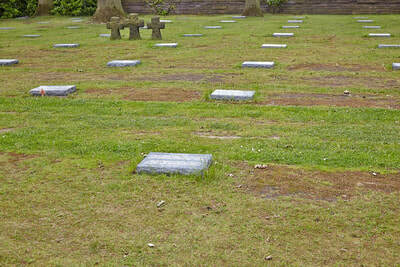 The cemetery, which evolved from a small group of graves from 1915, has seen numerous changes and extensions. 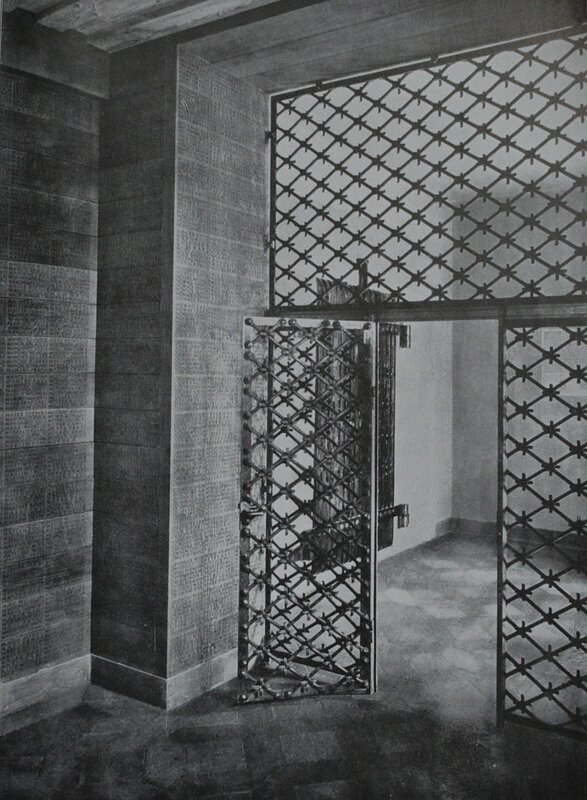 It was dedicated in 1932. 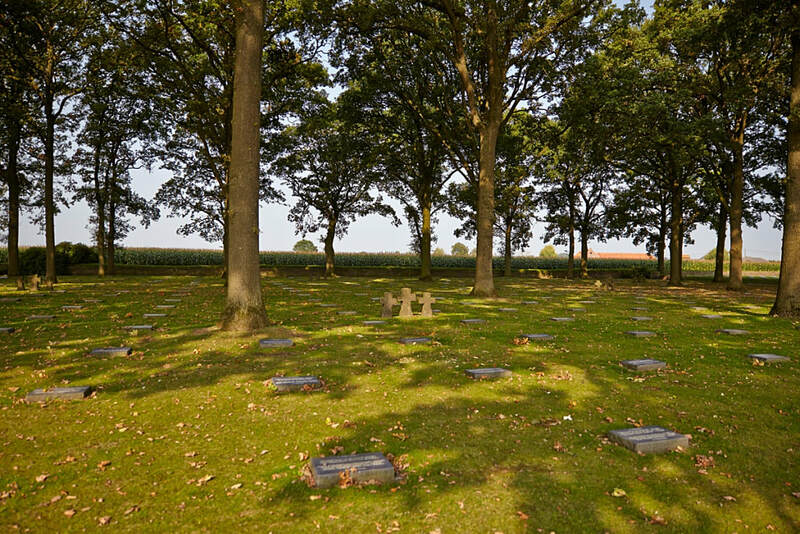 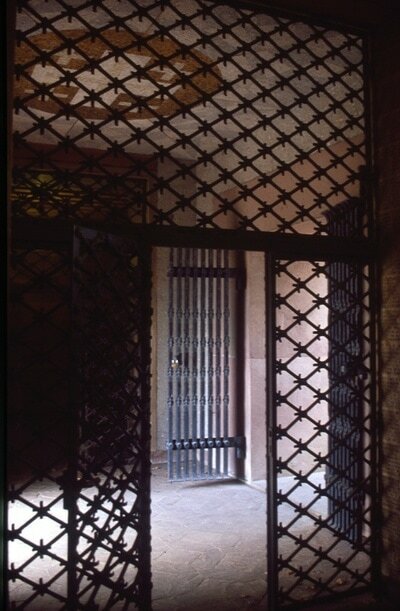 Today, visitors find a mass grave near the entrance. 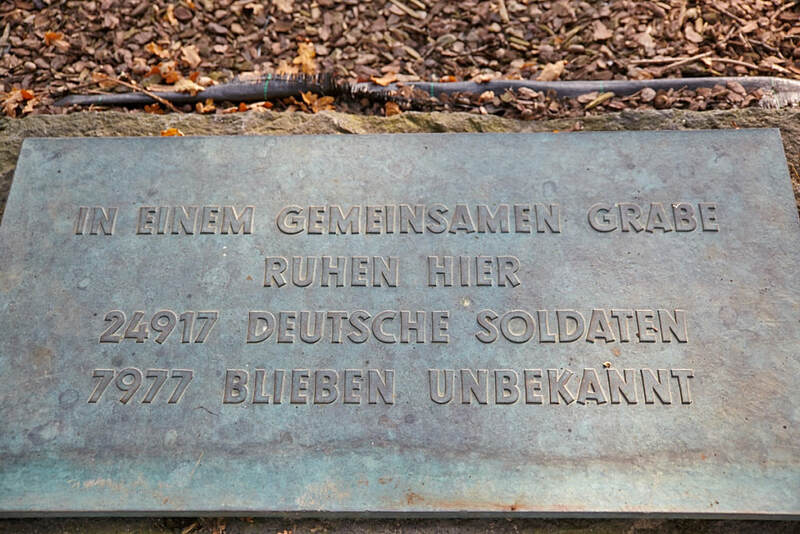 This comrades' grave contains 24,917 servicemen, including the Ace Werner Voss. 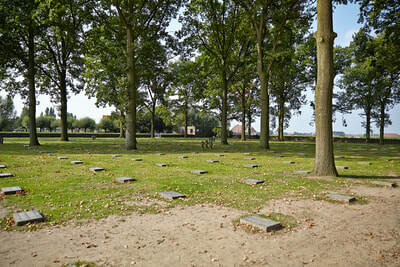 Between the oak trees, next to this mass grave, are another 10,143 soldiers (including 2 British soldiers killed in 1918). 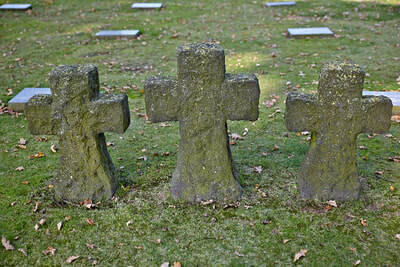 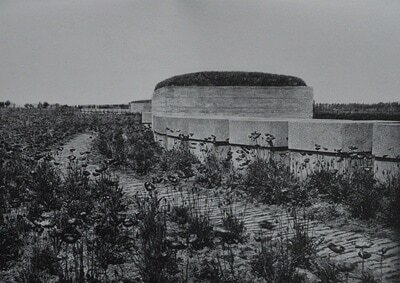 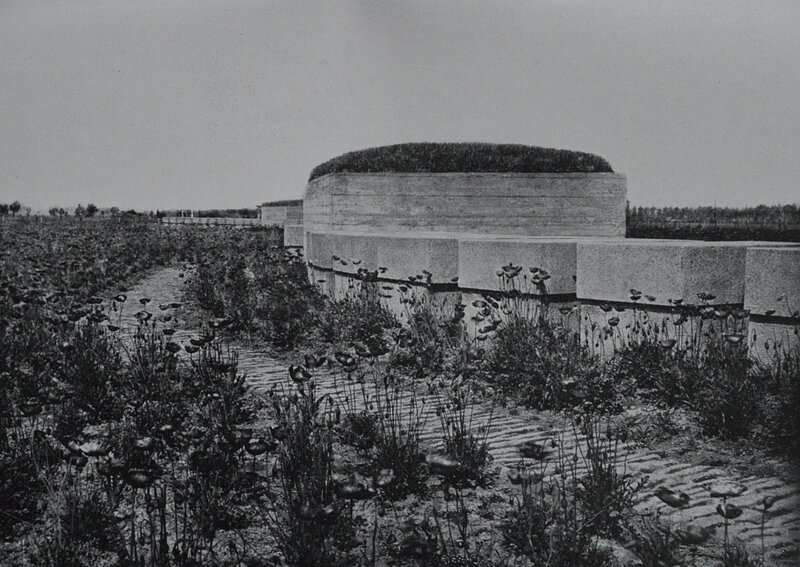 The 3,000 school students who were killed during the First Battle of Ypres are buried in a third part of the cemetery. 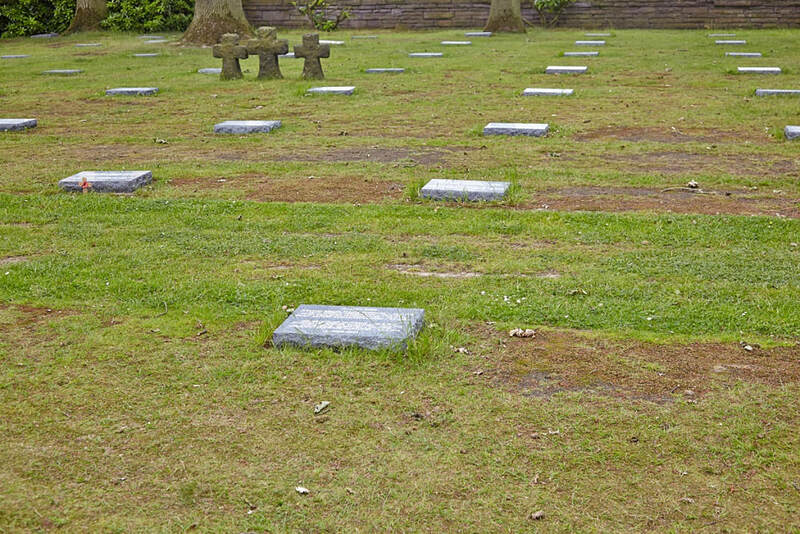 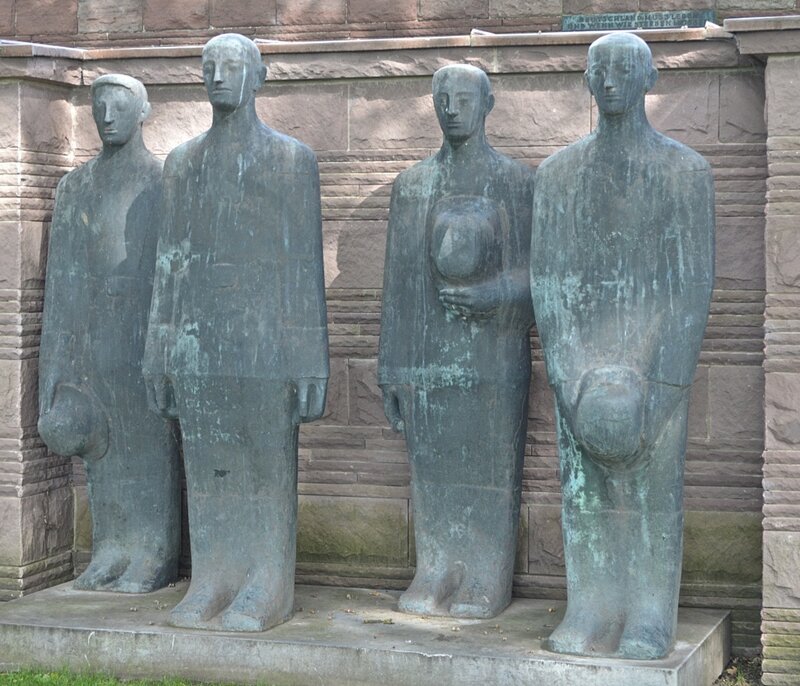 At the rear of the cemetery is a sculpture of four mourning figures by Professor Emil Krieger. 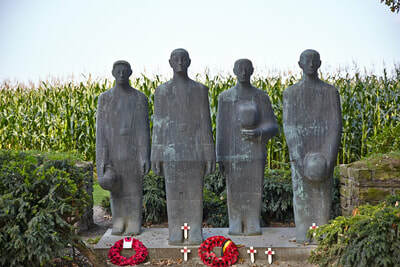 The group was added in 1956, and is said to stand guard over the fallen. 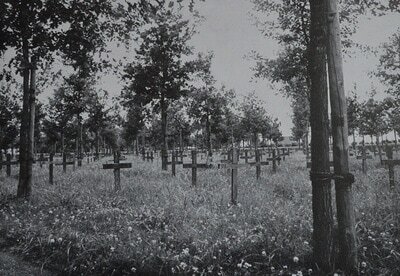 The cemetery is maintained by the German War Graves Commission, the Volksbund Deutsche Kriegsgräberfürsorge. 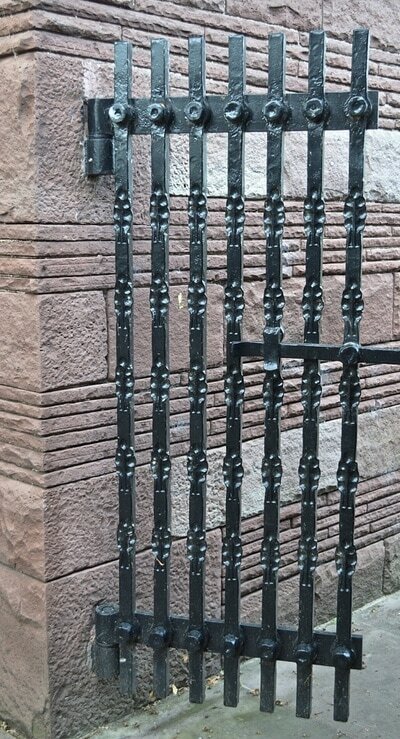 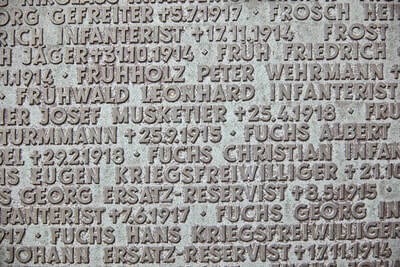 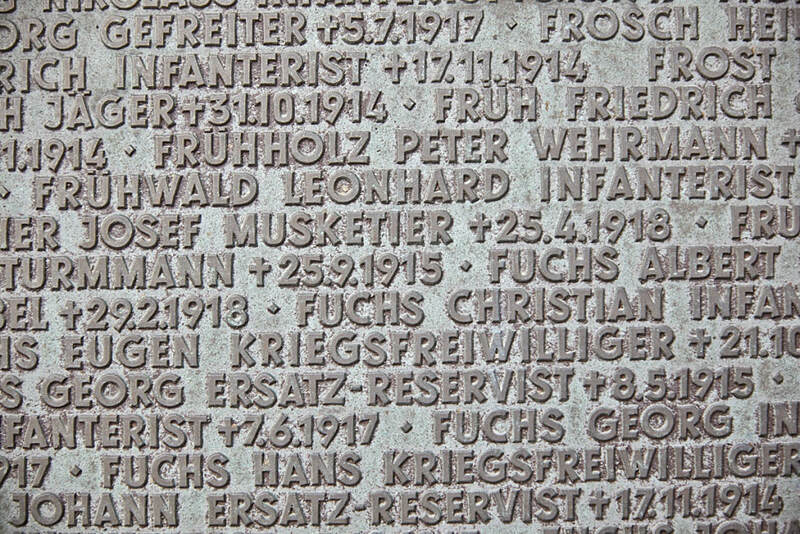 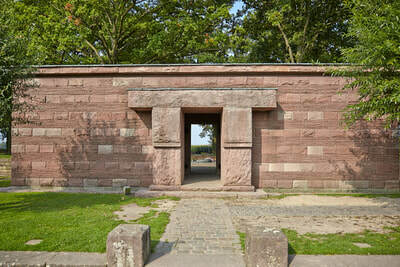 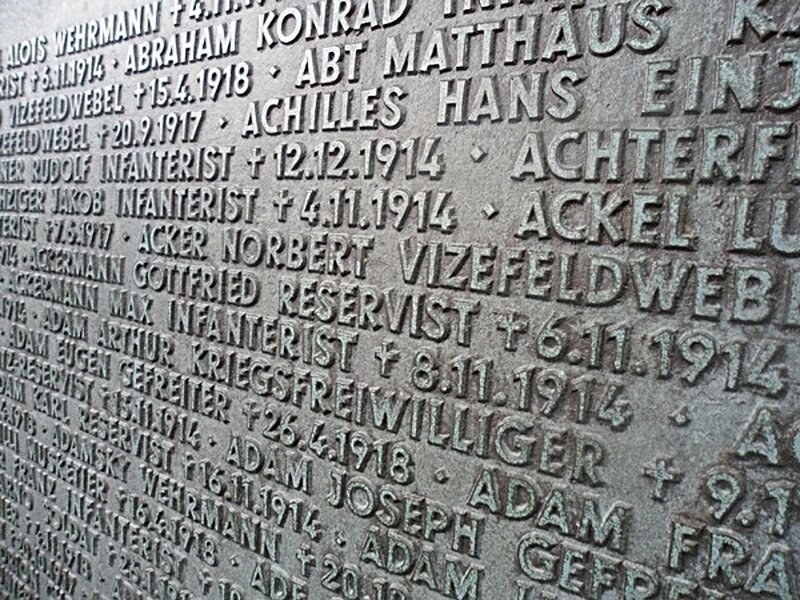 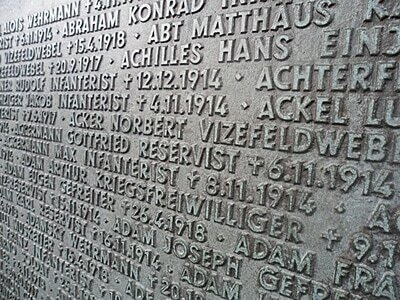 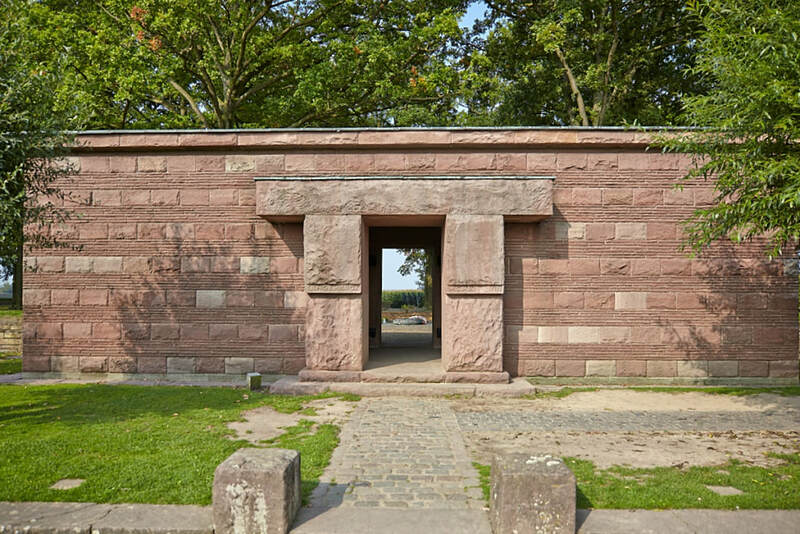 The names of the two British casualties can be found on a plaque to the left of the entrance, on the face of the first German memorial stone. 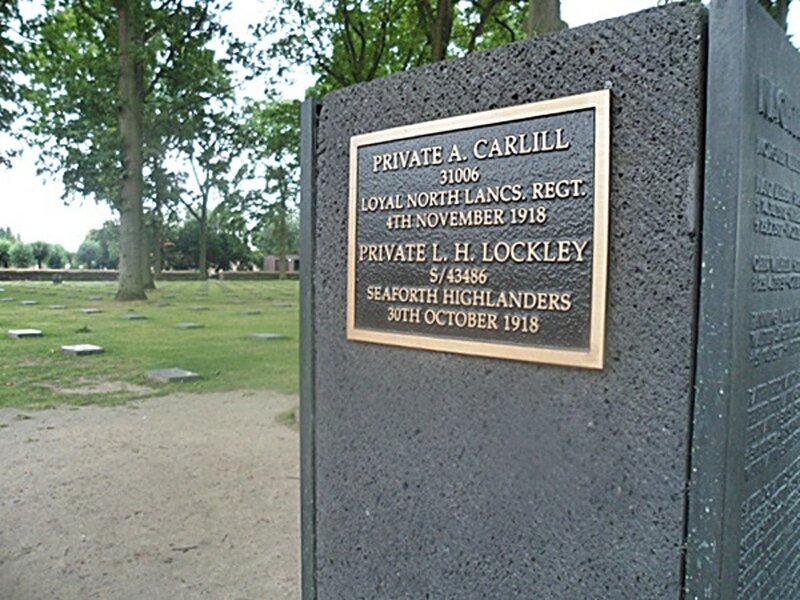 31006 Private Albert Carlill, 1st/4th Bn., The Loyal North Lancashire Regiment, died 4th November 1918, aged 19. 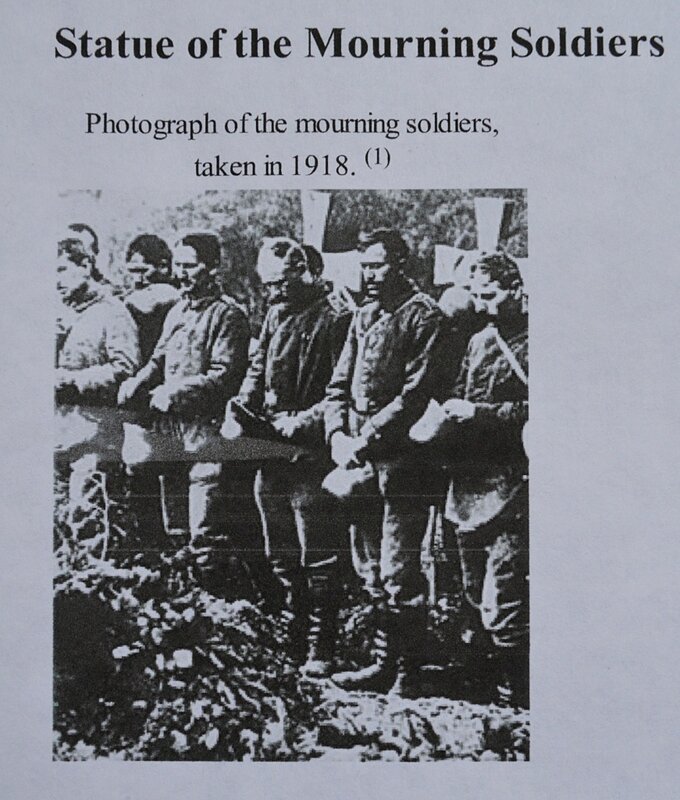 Son of William and Charlotte Carlill, of Welton Rd., Brough, Yorks. 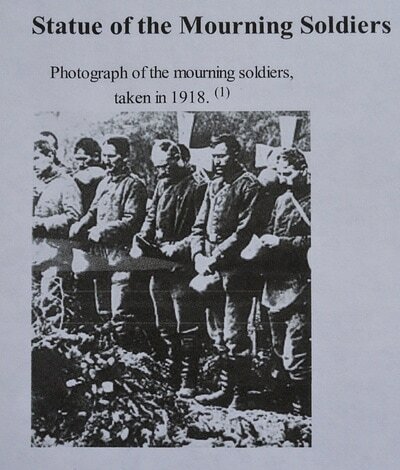 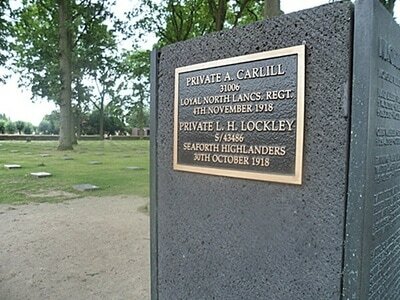 S/43486 Private Leonard Harry Lockley, 4th Bn., Seaforth Highlanders, died 30th October 1918. 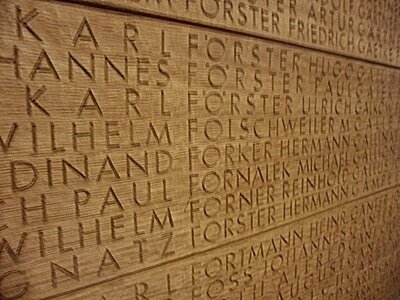 Son of Mrs E Lockley of 5 Morland Road, Fawcett Road, Southsea, Portsmouth. 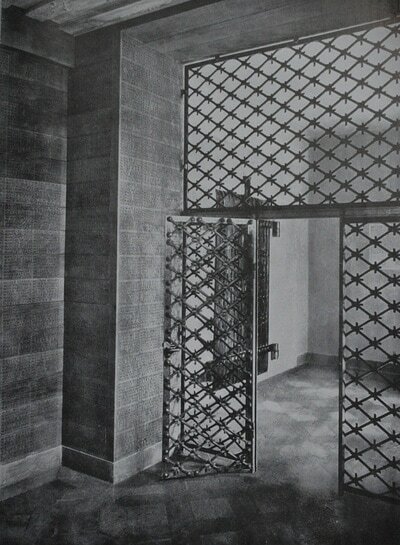 The three Black and White photos are from the 1940 publication: Deutschland Uber Alles. The 'Mourning Soldiers’, 1956, are by Emil Krieger (Prof of Fine Arts, Munich), the inspiration for which was the 1918 photo (the second soldier from the R was killed two days later).